Sleep your way to better everything with Masque Bar, Nip + Fab and Sephora! Masque Bar Sleeping Facial Mask with Lavender - 100ml - $19.99 - wake up to better skin thanks to a cream that helps relieve dry irritated skin overnight with a formula enriched with calming lavender extract while aloe and witch hazel moisturize and brighten. You don't need to use a lot and you don't have to worry about finding it all over your pillow, it soaks right into the skin - just make sure you wash your face in the morning - you won't believe how soft and glowy it will look! Nip + Fab Body Bust Fix Night - 100ml - $16.25 - a super-charged version of the original bust fix that works extra hard while you sleep to visibly plump, firm and smooth with a formula containing chronodyn which actively promotes cell regeneration while adding volume and firming the bust area. 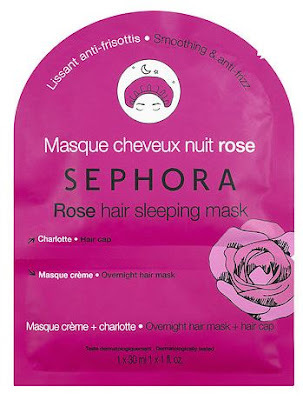 Sephora Hair Sleeping Mask - 30ml - $6 - in 4 types targeted to specific hair concerns: Coconut Mask - Nourishes and repairs hair fibers; Shea Mask - Fortifies and helps to prevent breaking and split ends; Rose Mask - Smooths and prevents frizzing; Acai Mask - Protects color and boosts radiance - just apply to dry hair, cover with the included cap and wake up to hair that is softer, more flexible and visibly more beautiful!